I’m BACKKKKK. After a longer than anticipated stay in Florida, I am back in the Big Apple and ready to cozy up. I have a feeling this week will be lots and lots of bright tights, faux fur coats, and LAYERS. Shop this look below! Faux Fur Heart Coat: Shrimps (I also bought this pink/red one and this ULTRA fluffy red one that I love). Shoes: Converse – sold out but a super similar pair is now in pink here! Jeans: Re/Done (on super sale). Tights: From my Halogen collection here. Sweater: Everlane. Also I replaced my favorite lilac phone case with a *new* mint one! Shop all the new colors here. I love the pop of orange, and that coat is lovely. Where is the clear bag from! I love it. I absolutely and always love ♥️the idea of faux fur look. This coat is so cute. Love it! This faux fur coat is just stunning. I’m in love with it! What a beautiful coat! Love the heart print! Oh my gosh, I just LOVE this coat! I am not into the traditional black or brown fur coat – I am all about making the fur fun. And that orange pop underneath? Perfection! Your coat is fabulous! So fun. What a fun print on that coat! Definitely eye-catching. Ohhh! I love this coat so much Blair! This coat is so so cute! 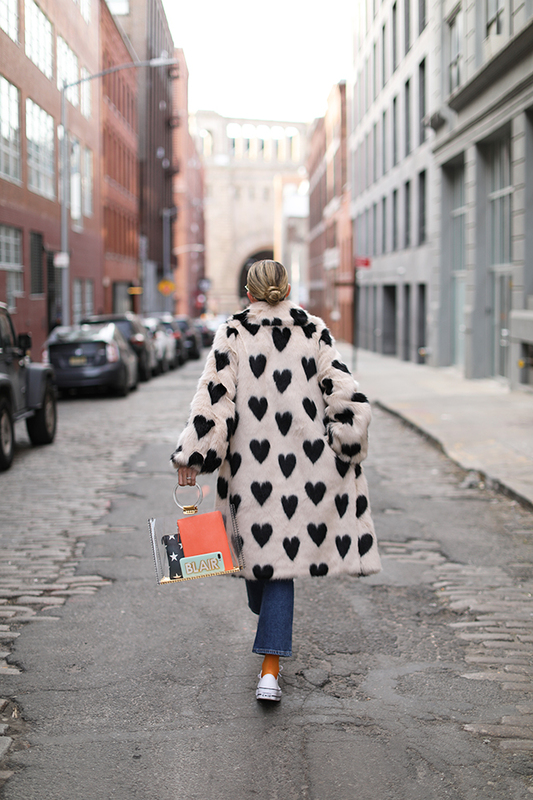 I love the fun heart print in the faux fur. Unique and very chic. Hi BLAIR, My name is Hormony, your blog is awesome and beautiful pic it’s much impressive. I am beyond obsessed with this coat! It is so fun and such a statement pieces!